It’s amazing how life’s events teach us a few things about ourselves and evoke emotions that we thought we had conquered. I’ve had “bad joints” pretty much since before I was born, considering I was born with Spina Bifida. I wore leg braces of some kind for most of my life and have used a wheelchair at least part time since I was nine years old and full time since about age 20. I’ve always known that I would get weaker physically as I aged so it seems odd that I find it so disheartening right now. To be clear, I’m not depressed per se about my situation or all down in the dumps. I’m just frustrated and fighting a myriad of emotions. All accompanied by physical pain. I first injured my knee in high school. It was diagnosed as irritated cartilage and I wore a special brace. It hurt and since then my right knee has always been my “trick” knee. I could be sitting there and letting my legs dangle and my bad knee would rotate almost inside out. I would have to “pop” it back in place. That knee was always a bit more swollen-looking too. A few months ago, I started noticing that my knee frequently hurt and it was more difficult to extend my leg fully. I first thought it was from a couple bad falls I had and also from the bad weather we had all winter. But it kept getting worse and worse and the pain was keeping me awake at night. I had to see my PCP for something else about a month ago and as an afterthought I mentioned my knee. I guess I had gotten so used to it that I didn’t realize how weird it had become. Apparently having a leg that angles outward and a knee that can only be halfway flexed most of the time is a bad thing. 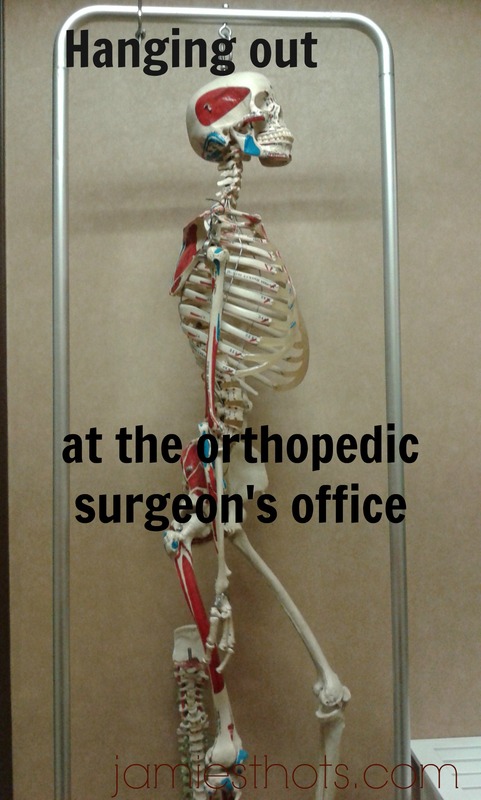 He referred me to a local orthopedic surgeon I trust and I saw him today. It turns out I’m not crazy, that the pain is real and that there really is a problem. The good and bad news is no surgery. Good because well, no one will be cutting me open. That would be costly both in time off work and paying the medical bills. Bad because it’s not that the knee isn’t bad enough to need surgery. The way I’m taking it is that the knee is bad enough that there’s nothing they can do. A total knee replacement might help but I’m young and to do that for messed up ligaments is not the best course of action right now. The right knee is the one that’s messed up. 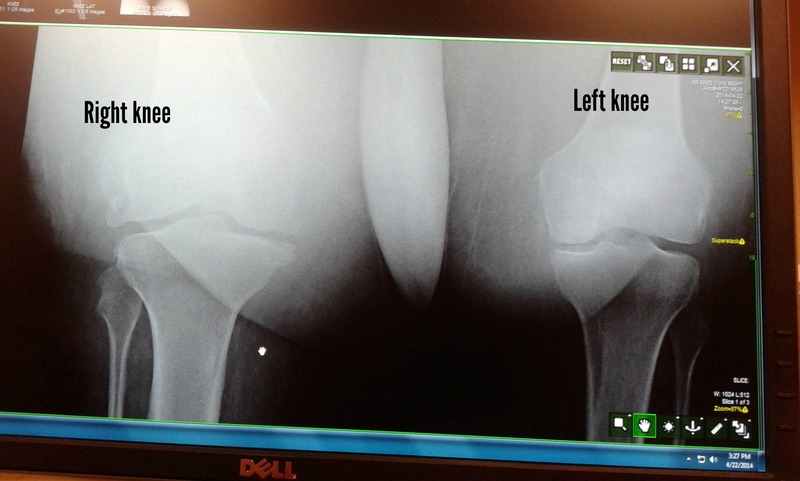 I couldn’t help but think it’s interesting that as soon as he saw the xray the surgeon said “I assume we’re talking about that right knee.” If you look closely, you can see that even the bones are much larger than the other knee and there is spurring on the bones. Oh, that weird thing between my thighs is just what they put to help me separate my legs. My bad leg kept bowing in and hitting the left knee. Fortunately, an MRI or other further testing was not needed either. He was able to diagnose me with a “deficient MCL” and I think he noted something about my ACL. MCL is medial collateral ligament and it’s basically the opposite of the ACL in the knee. It’s on the interior. Mine is either completely torn or deteriorated. Apparently that’s why my leg bends to the side and why it can be bent so freely from side to side (it’s not supposed to do that). I’ve been fitted for a custom brace (it’s going to be metallic purple, how cool is that?) and it will be the first time in 16 years that I’ve worn a brace. In a way I don’t mind in a way I’m dreading it. I just hope it works. Once we get it straightened out I can start some light physical therapy. Oh, I was also prescribed NSAID cream which is a huge miracle for me. I haven’t been able to take NSAIDs since 2005 because of the gastric bypass. The cream bypasses my stomach though so it’s safe to use. I’m usually the type to show negative feelings on my blog after I’ve sorted them out and felt more squared away so to speak. I feel the need to “stream of consciousness” write tonight both to help me sort things out but also because I know a lot of people have been praying for me and want to know what happened at the doctor. The thing is, there’s no real way to know how it happened or even when it happened. Was it a long-term problem that grew over time? Did something snap when I had my bad falls in January? Here’s where the emotion and guilt comes in. I’m fully aware that my weight is probably a factor. It’s at least a factor in making it more difficult for me to be ambulatory despite the efforts to help the injured knee. Part of me is angry at the idea that someone could use this against me to shame me, part of me feels like that won’t happen. It’s almost like I have to shame myself to call out the obvious yet I know that’s not healthy or even Godly. Right now I’m struggling with uncertainty, guilt over the finances (even though a brace is way less expensive than surgery and months of PT! ), and a general sense of loss. Crazy, huh? The girl in the wheelchair feels a sense of loss over reduced mobility. Just like someone who is newly injured, I’m having to adjust to a new normal. After all, it’s not like a sprain that will gradually get better and be healed. So where does this leave me? It leaves me choosing to trust God. I say choosing because right now it doesn’t feel natural. I don’t blame God at all for any of this, but it’s in my human nature to want to worry and try to fix things before “bothering” God with it. It’s like the pickle jar…I want to see if I can open it first before handing it over to God. I’m sure I will talk more about this journey but for now, thank you for letting me share my heart. Jamie you have obviously been on a journey with your Spina Bifida. Now another. And you are finding your courage. I loved Rudolph Guliani’s quote after 9/11 and I won’t quote him exactly: Courage is not a lack of fear but knowing you are afraid and going on. Managing it. Good luck with that! Thank you! I really appreciate your kind and encouraging words. I’ve learned that sharing my journey can help others through their journey but also helps me process my own.